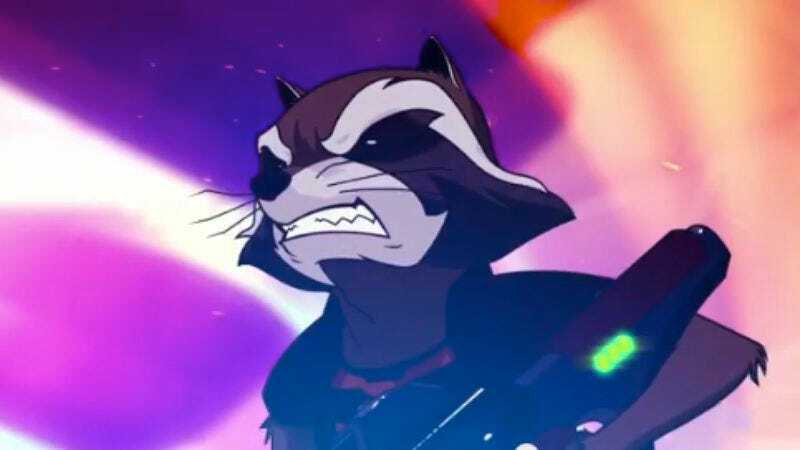 Marvel released a glimpse of it’s upcoming Guardians Of The Galaxy animated series at New York Comic-Con last week—though it was possibly the same glimpse they released at San Diego Comic-Con. The series will air on Disney XD next year, but the minute-long clip reveals an animation style closer to Akira than Phineas And Ferb. It also confirms that the transition to the small screen has preserved Guardians’ most important element: a talking raccoon who wears people clothes and fires an enormous gun. We also get a brief look at Star-Lord, who thankfully seems to be his own man and not a Chris Pratt impression. No sign as to whether the series will use the Kree as recurring villains, as they were in the film, as the only enemy who appears in the clip is an unmanned drone. Thanks, Obama.